Facial lotions are designed specifically for your face. The problem with using just any type of tanning lotion on your face is that it is made for your body! There is so much more your face needs compared to your body that body lotions don't provide! All facial lotions for indoor tanning have essential vitamins, nutrients, and moisturizers to keep your skin healthy during and after tanning. If you don't use any facial lotion your skin will dry out fast. Your face is very sensitive, tanning with out a facial lotion can cause wrinkles and fine lines to appear much sooner. 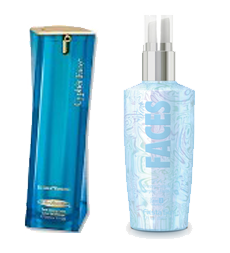 Ask your tanning consultant to show you some of the facial lotions available! Once you try it you won't go without it!